This extremely dry season yielded me a handful, literally, of coral mushrooms—a clump of Clavulina coralloides (a white coral) and two of an orange coral, Ramaria (R.carnata, I believe). With nothing to lose and a desire to dye with something other than Phaeolus, I decided to put the two clumps together and see what happened. The corals went into a fine-mesh bag, then into the dyepot with a silk chiffon scarf previously mordanted with iron (and tied with a few loose knots for mottled colour). I initiated my new induction burner, which I found to be perfect for heating the dyebath slowly. 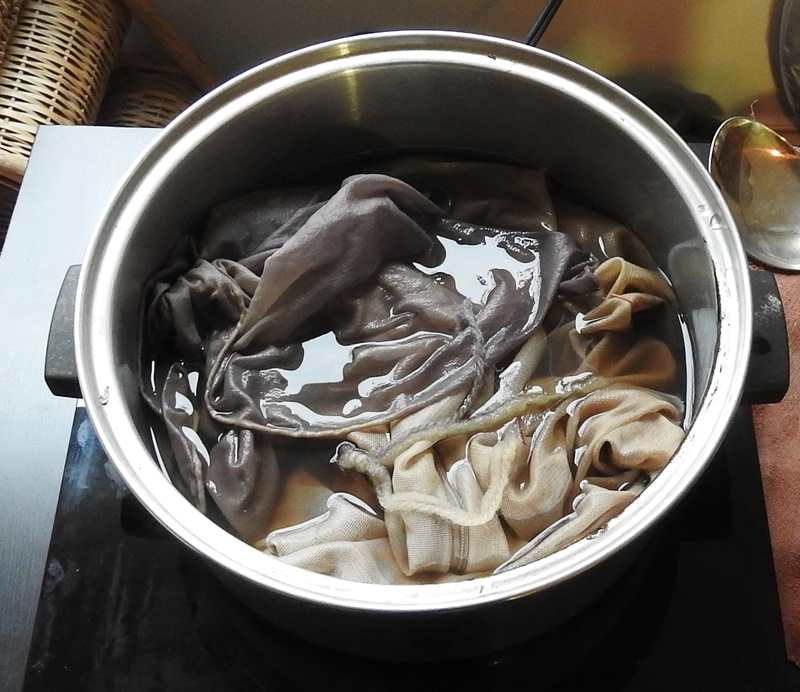 Determined not to lose any chance of obtaining the fragile purple (in the natural dye world, purple is known to lose its colour if cooked above 160 degrees F), I hovered over the dyepot as any good witch would, monitoring the temperature carefully. To my surprise, the silk began to darken at 110 degrees. and I let it heat to 130 before pulling it. 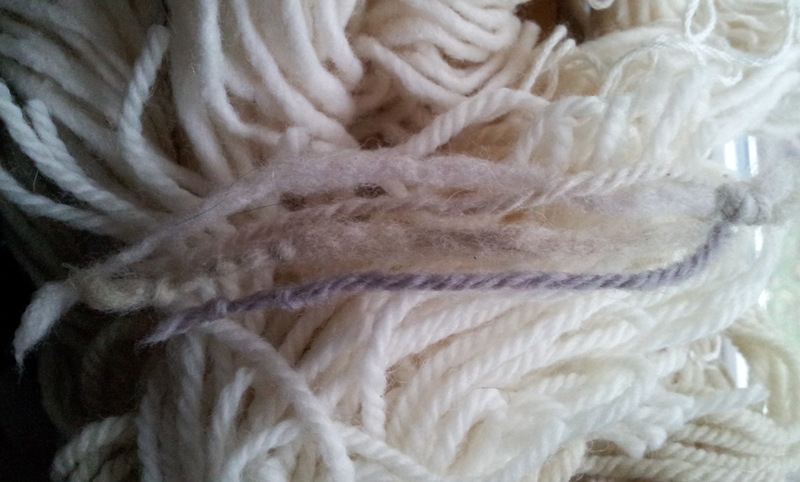 You can see, a bit off centre, the little bundle of yarn samples I also threw into the pot. 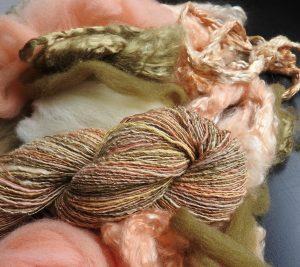 These are mordant samples—a strand each with no mordant, alum, iron, and copper—that I put into every dyepot to monitor its progress. With these, the iron strand was also developing a purple cast, while the other mordants were pretty much doing nothing. 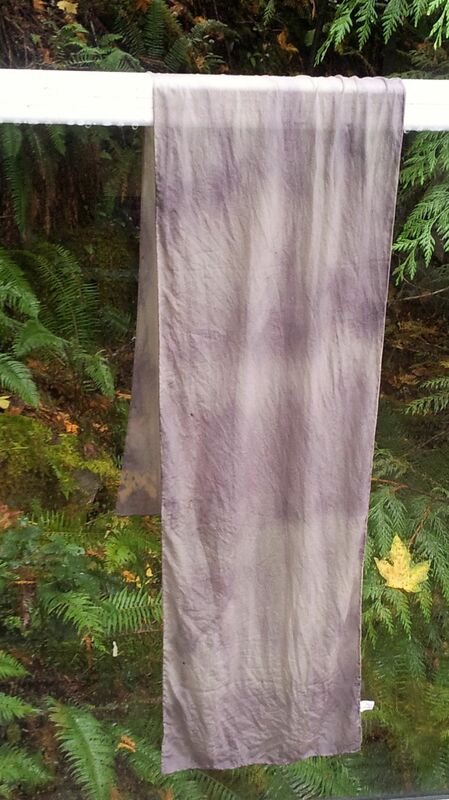 Here’s how the iron yarn sample turned out, though perhaps not as obviously purple in real life. Below is the scarf. 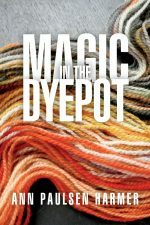 I tried an exhaust dyepot with a piece of silk roving, but the corals had been truly exhausted. I got no further colour. I have every hope that next year the forest will produce mountains of coral, and I plan to have all manner of silk mordanted and waiting to be transformed by this royal colour. Mind you, I have nothing against pleasant gold, but an over-abundance of Phaeolus schweinitzii, now drying on my studio floor, promises more gold this year than I really care to think about just now. I feel blessed to be living with a rainforest just outside my door, never more so than during mushroom season. 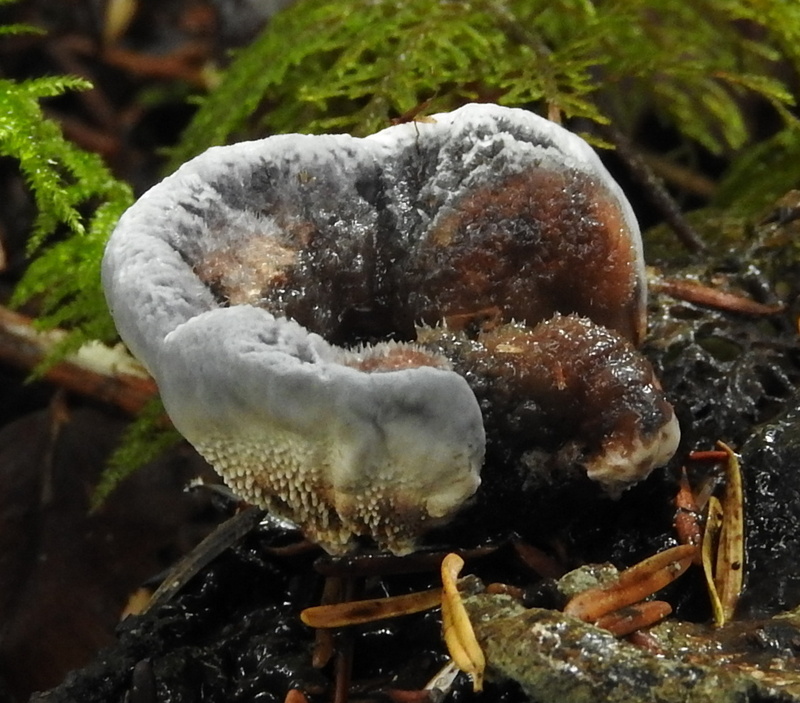 Even though this year has been terribly dry and the season late, with few mushrooms to be seen so far, the Phaeolus schweinitzii, or Dyer’s Polypore, have proved the exception, guaranteeing some golden dyepots this year, at least. 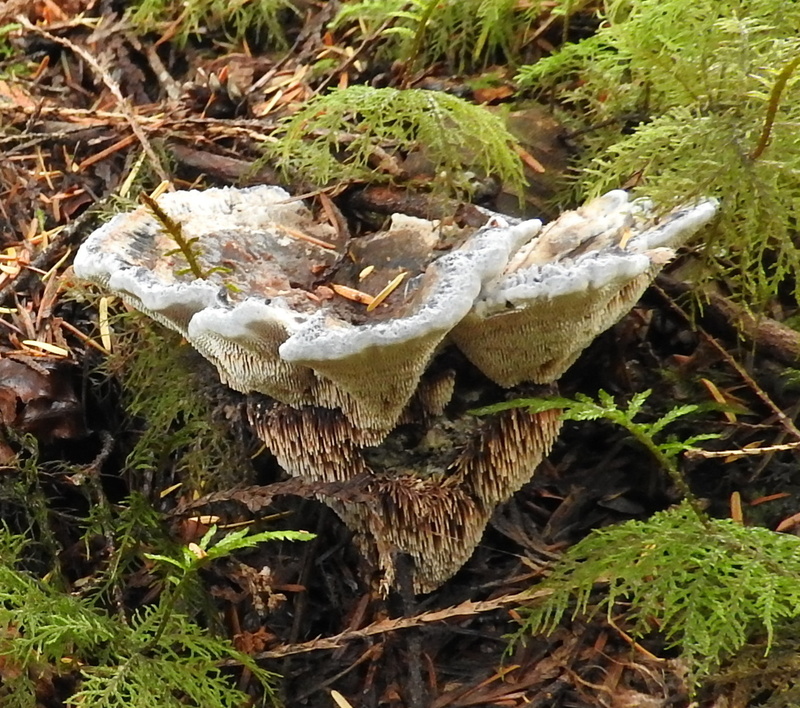 I can always count on one old, mossy stump near a swampy area to come through with a beautiful specimen, and this year it surprised me with twins on its top surface. This provided the perfect opportunity to photograph how their growth progressed over the three weeks after I spotted them, by which time they were in prime condition and fairly begged to be harvested. Amazing what they accomplished in three short weeks! 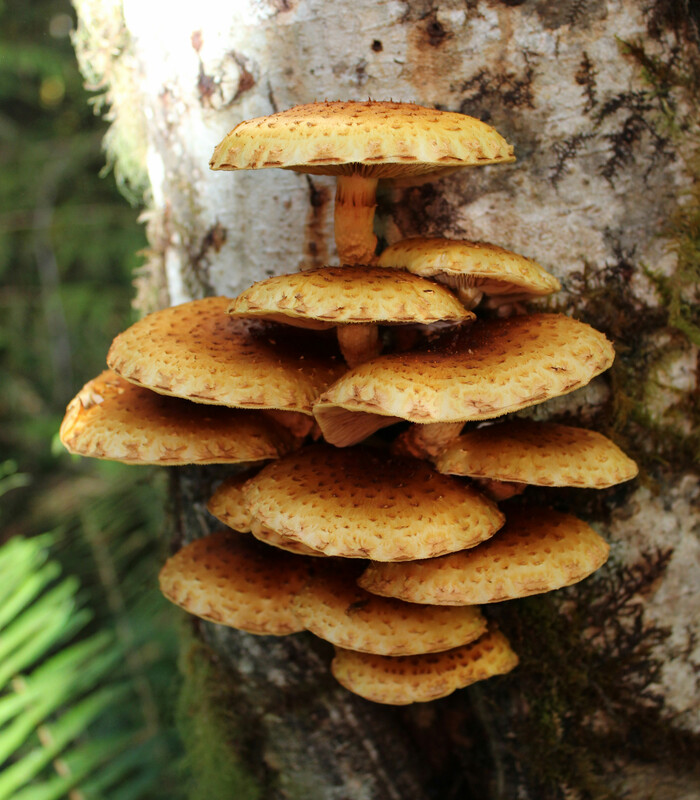 This was one of the driest summers ever on the Sunshine Coast (I’m so grateful it wasn’t like this last year, leading up to the Fungi & Fibre Symposium!). The long-range weather forecasts keep teasing us with promises of good, long rains, then amend their predictions downward until, as is happening today, we end up with a few sporadic showers. 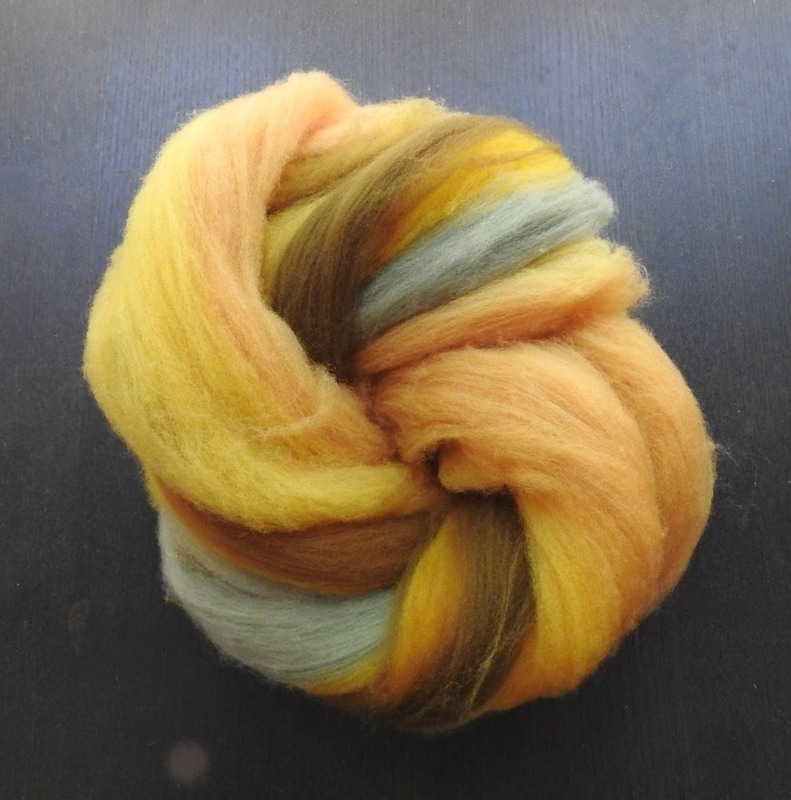 Mushroom season won’t be long now—I’ve found a few early Tapinella already, although most will appear later—so I’ve been playing on my spinning wheel with some of the colours I got last year. This batt contained Phaeolus gold and green, Pycnoporellus peach, and a bit of Sarcodon blue. As usual, I’m ending up with more yarn than I have time to do something with; perhaps this yarn will end up in someone else’s stash, someone who can put it to good use. The activity in my dyepots has slowed down lately, as my deck workspace is open to the afternoon sun, and my Nordic blood doesn’t take kindly to intense summer (well, almost-summer) heat. So I’m concentrating my efforts on combining mushroom colours, which always seem to go well together no matter which ones I choose. 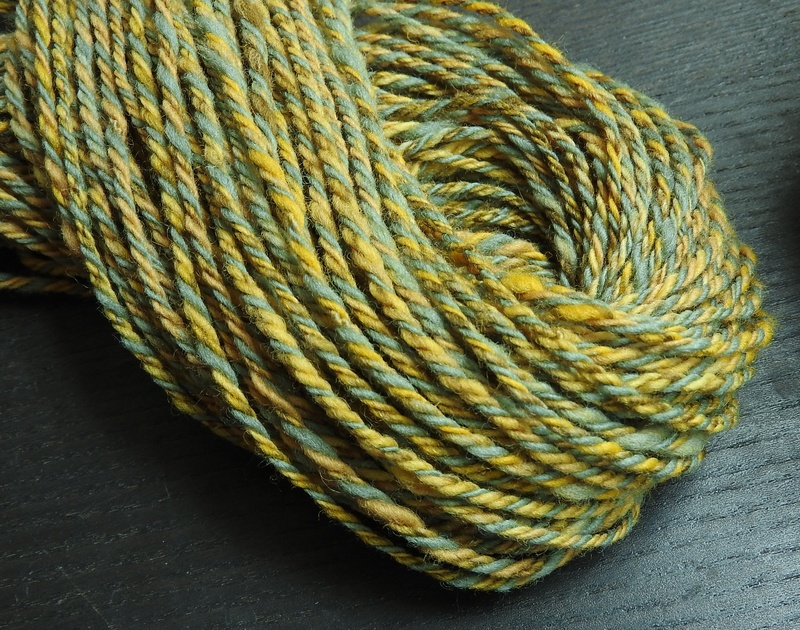 I ran these colours through my drumcarder in lengthwise stripes: the yellow and bright gold (not all that visible, but it’s there) are from Dyer’s Polypore (Phaeolus schweinitzii), as is the forest green (resulting from an iron mordant). 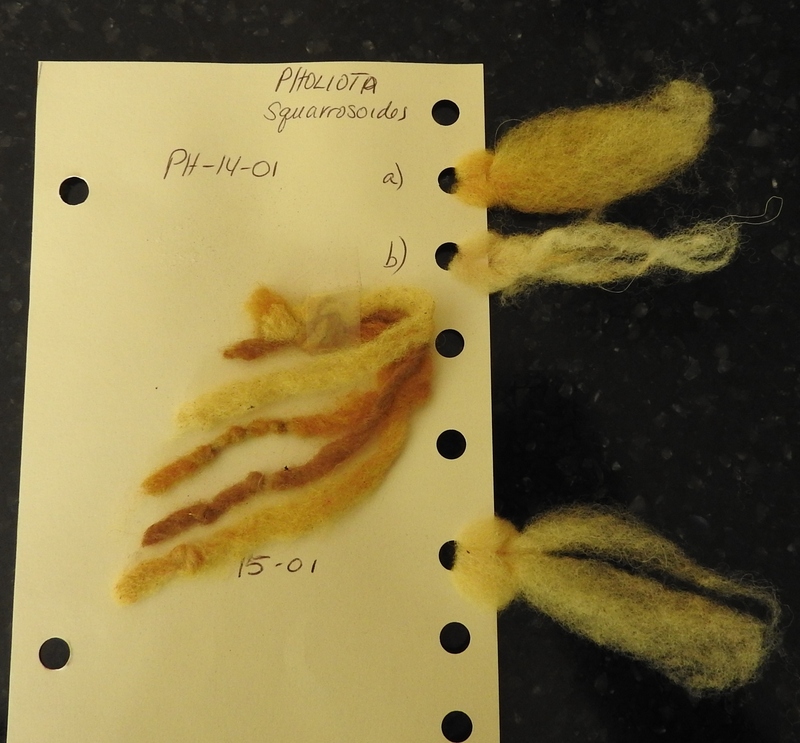 The blue is from a successful Hydnellum aurantiacum dyepot, while the peach colour resulted from overdyeing a not-so-vibrant Phaeolus exhaust with the exhaust from a Lobster (Hypomyces lactifluorum) dyepot. I won’t get to the spinning for a few weeks—I’m off to Toronto in early June to teach a one-day workshop at the Contemporary Textile Studio Co-op, where I’m looking forward to comparing mushroom notes with students from that part of Canada.